You are here: Home / About Zensol / What have we accomplished ? Thanks to our consciencious and applied work, we totally conform to the ISO quality managaement system since1999. 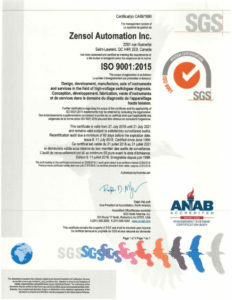 In July 2018, Zensol has risen to ISO 9001: 2015. The ISO 9001:2015 certification is proof of a certain level of requirement concerning the implementation of a quality management system. Partners and collaborators for over 20 years, Zensol and Hydro-Québec maintain a long-term relationship of confidence. 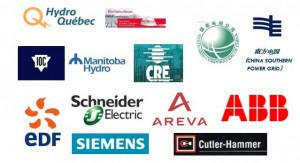 Exclusive supplier of electricity in Québec, Hydro-Québec required reliable, solid and easy to use instruments which allow them to ensure the distribution of clean and renewable energy to its customers. The Zensol team, with its highly qualified engineers, are constantly working to develop instruments and software able to answer the needs of Hydro-Québec. These years of collaboration have led to the creation of innovative methods, such as vibroacoustics, recognized worldwide for its complete solution for on-line tap changers. The extreme temperatures that we live and work in have pushed us to develop these methods as well as quality instruments able to take on these climate conditions. Zensol Automation Inc, is more than 1000 collaborations with the top names in electricity around the world. Backed by this experience, we are able to adapt to your needs and to meet your highest expectations.